Over the past few weeks Arbworx has been busy with a big garden project. 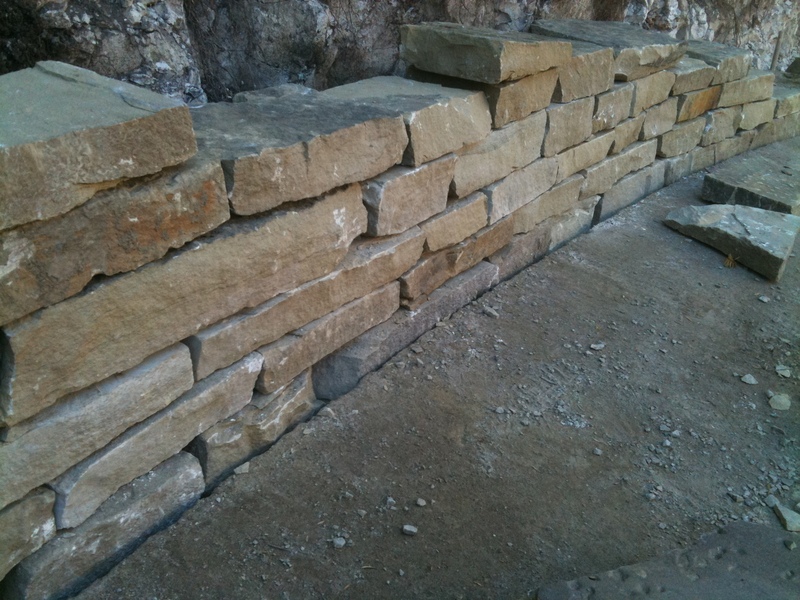 One of the main features is a 22 metre dry stone wall built from natural York stone, around 9 tonnes of the stuff! 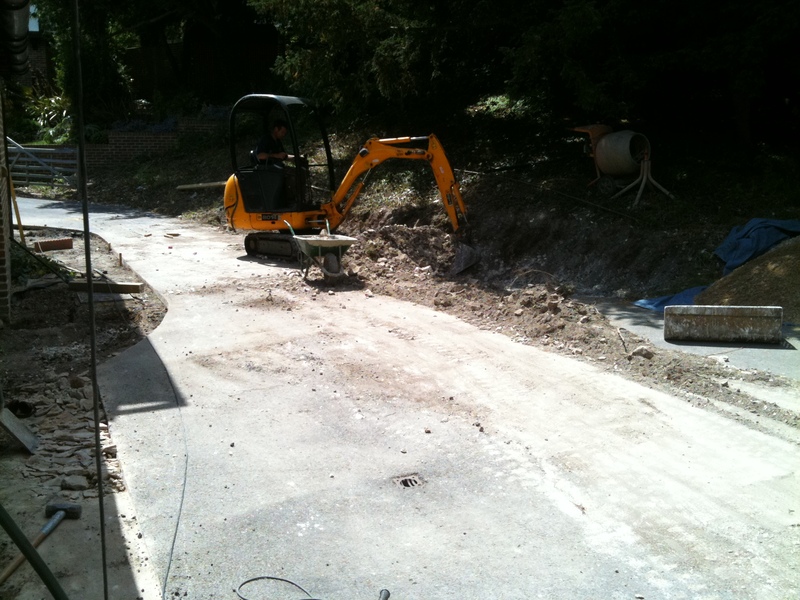 The wall runs alongside a newly widened driveway, which will be resurfaced with tar and chip once complete. The wall also retains a wide sweeping woodland slope. Natural stone is soft in appearance and works well in a more rural setting, gently following the curves of the landscape yet defining the two separate areas. The start of excavations into the woodland slope ready for a concrete pour to widen the driveway and define a new edge for the wall to follow. Once the all work on the drive is finished it’s time to start looking at the line and levels of ground upon which the wall will be built. We are working in chalky soil with the new 150mm thick concrete edge for the base rocks to key into; these are good, solid conditions to build on. Normally a trench would be dug down to solid level ground and the base rocks would be laid within this, but with a chalk sub-base this is not required. It is critical the base rocks don’t move otherwise the wall will fail over time. 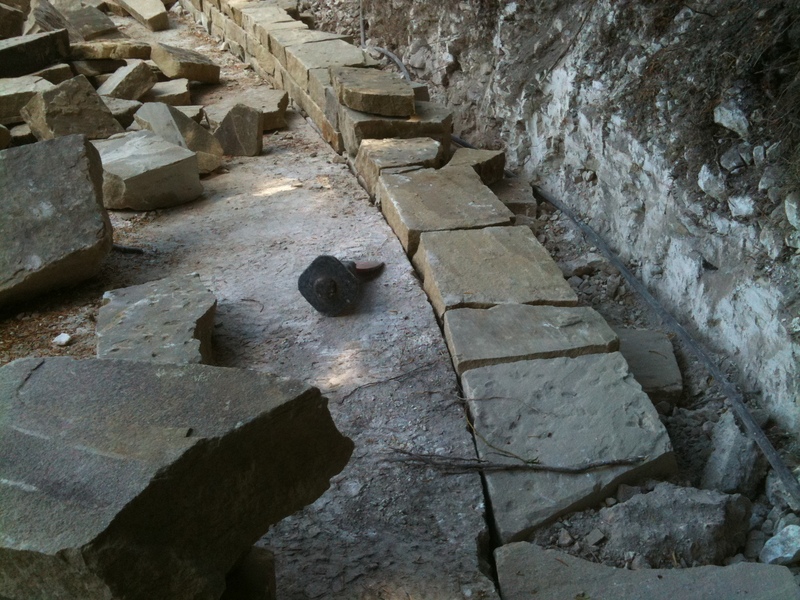 Here we can see the base rocks laid in the trench and butted up to the concrete edge. Big, wide and heavy is the order of the day as you should be able to walk along these rocks without them moving at all. They should also be set as level as possible with steps up and down to deal with any gradients. Once the base course is in place the wall can start to take shape. The advantages of a dry stone wall are as follows. – Drainage – obviously a dry stone wall is free draining and won’t be affected by water undermining it. This can be the undoing of many a brick or concrete wall. – Aesthetics – local materials should always be used wherever possible. A great deal of conservation work is carried out to protect old walls in England as they are a key part of our rural heritage and in a modern world traditional crafts like stone walling are less common than they once were. Taking into account the fact that different sites may have difference design requirements, we always try and use the most suitable material in each case, hence using York stone in Sussex. York stone is a common material in many towns and cities in England. – Durability – over time a well built dry stone wall becomes stronger as it settles and locks together. The key is to build it properly! In part two I’ll talk more about the techniques used to build a wall and what pitfalls to look out for, as well as more information on this particular project.